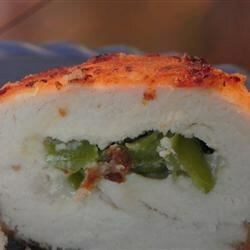 "This is a wonderful slightly spicy version of the classic Chicken Kiev. The kick of green chilies will make your family want more! You have to use sliced green chilies, not chopped." Place 1 chicken breast between two sheets of wax paper. Working from the center to the edges, pound with a meat mallet until flat and rectangular shaped. Repeat with remaining breasts. Wrap the green chili strips around the cheese, then wrap the flattened chicken breasts around the chili and cheese. Secure with toothpicks or uncooked spaghetti noodles. Combine the bread crumbs, parmesan cheese, salt, cumin and pepper. Bake in a preheated 400 degrees F (200 degrees C) oven for 25 to 30 minutes, or until chicken is no longer pink and juices run clear. A classic and impressive chicken dish with a secret surprise inside. This was pretty good, but we didn't find it "FABULOUS". The chile pepper was still crisp, but it had good flavor. I may try it again with some tweaking. OOOH so good!!! I love this and so does my family--- kids included. I didn't use cumin any time I have made this so far (didn't have) and still was just incredible!! !